Happy June! 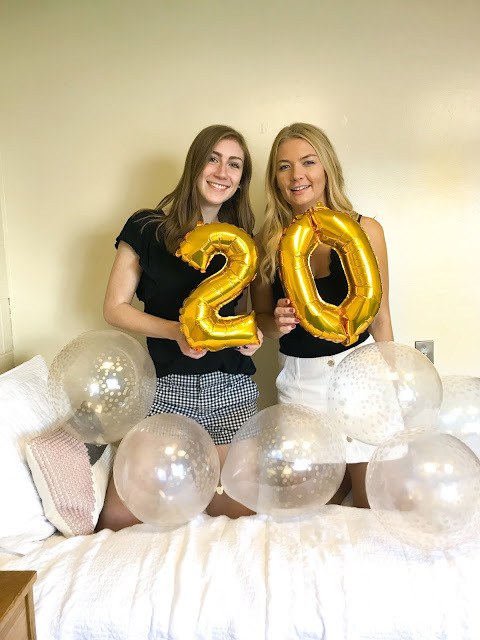 Finally back on the blogging grind again after traveling (post to come later this week!! 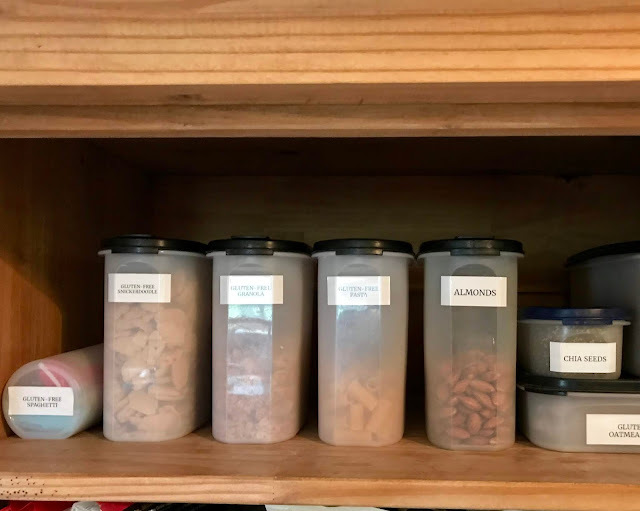 ), having extremely bad allergies, and starting nannying for the summer... On Sunday I started AND completed one of the projects on my list, and that was completely organizing the pantry! 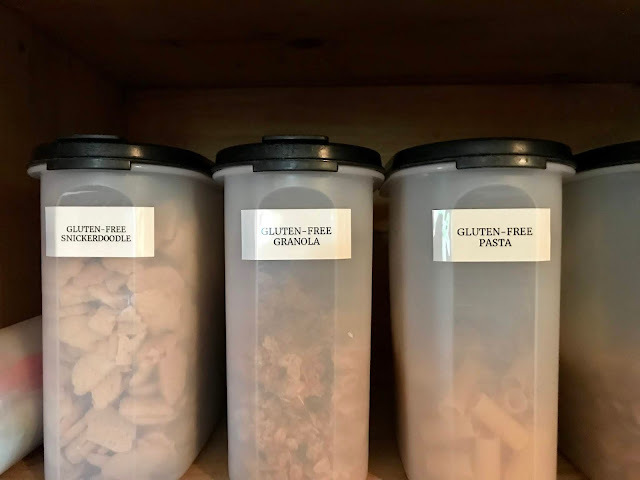 In my home we basically have two different pantries, one is for gluten-free foods, this is where everything is pre-checked that it is gluten-free because my sister and me are both gluten-free, the other pantry has all other foods for the rest of my family. The gluten-free pantry had gotten SO messy! I really wish I thought to take a photo of it (duh!) but, I completely forgot and just got to work after grocery shopping Sunday morning. 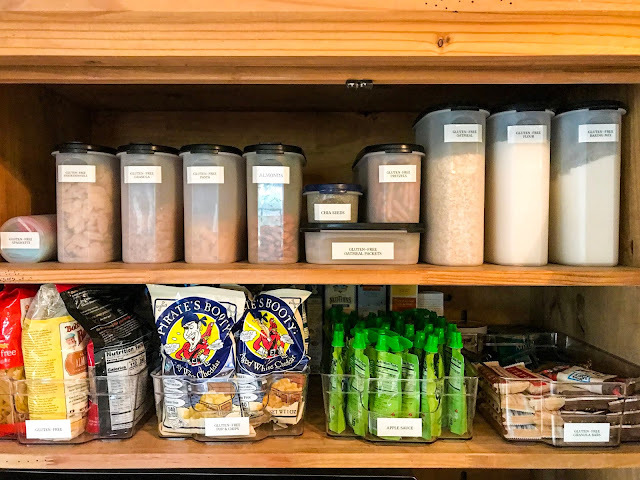 So, I wanted to share my process of organizing this pantry. Oh, and I forgot to mention I managed to only spend $10!! After grocery shopping Sunday morning, I came home and started to put things away. 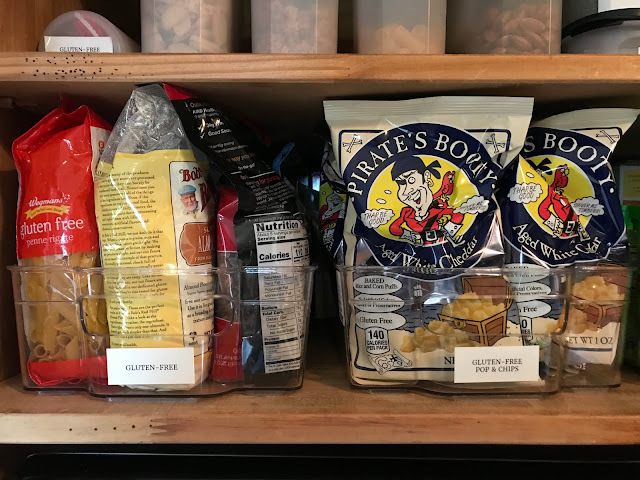 When I opened the gluten-free pantry I was reminded of how incredibly messy and overflowing it had become! So, that is why I decided to organize it. 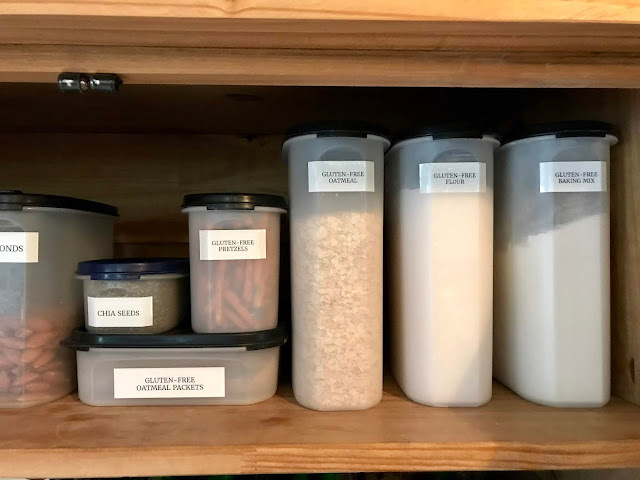 I basically wanted to organize it in two ways, one with bins for things like snacks and other prepackaged items and then with containers for things like flour, almonds, etc. I completely emptied the cupboard onto the table and sorted everything into groups - bins or containers. Then I went through and made a list of all of the bins that I needed - granola bars, apple sauce, popcorn and chips, and gluten free (this bin is for flour, granola, etc. to refill the containers). I ended up looking to see what containers I could re-prupose that we already had in our house and found two clear fridge containers that we had gotten at TJMaxx which were absolutely perfect because they slide out extremely easily. I ran out and got two more of the same containers which is why I spent $10. 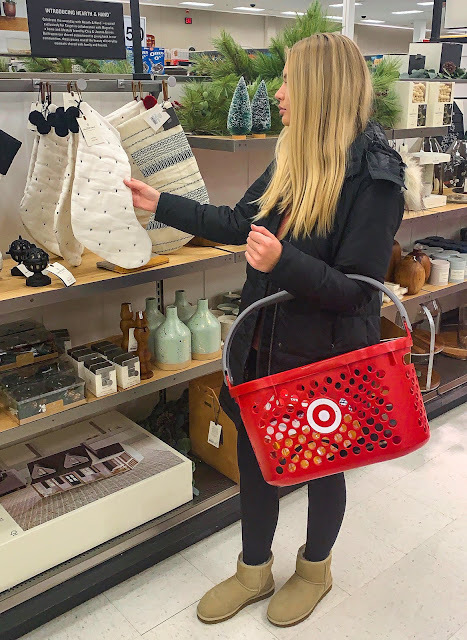 You can find a similar bin here from Amazon, although I highly recommend checking out TJMaxx because they were way cheaper there. After I put everything into the four bins I labeled them with my DYMO mobile labeler. It is so easy to use because it just uses an app on my iPhone and connects through bluetooth. It is also rechargeable, so I was able to just set it on the table next to me and print all of my labels as I came up with them. Part two, I put the "staples" of the pantry in containers. 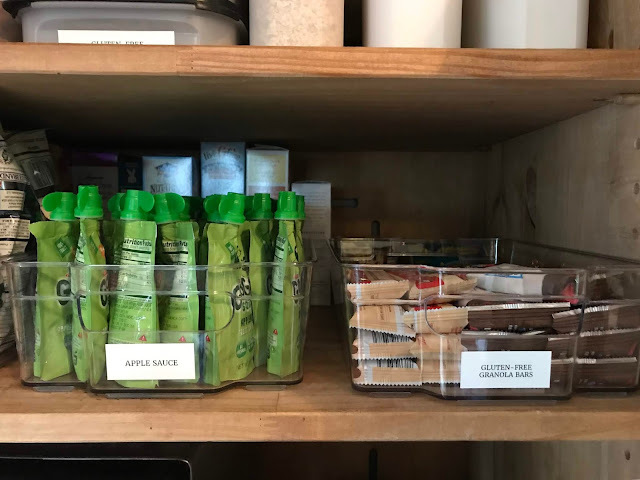 These staples included: spaghetti, Annie's snicker doodle cookies, granola, pasta, almonds, chia seeds, oatmeal packets, pretzels, oatmeal, flour, and baking mix. I used Tupperware Modular Mates containers, which I already so that everything will stay super fresh, I love that they all match and you can see exactly what's in them too. Then I also labeled these containers as I filled them with the DYMO mobile labeler again. It was really handy here because I was able to label as I went, instead of having to figure out was everything was after it was all in containers already. I'm super excited with how the pantry turned out and it will be super easy to keep everything organized with the way it is set up!